Roasting vegetables brings out deep, rich color and flavor. Add the nutty taste of whole wheat pasta, the sweetness of fresh basil and a hint of salt from the Parmesan, and this recipe will please your whole palate. Cut the tip off the top of the garlic cloves. Place on a small piece of foil and drizzle with 1⁄2 tsp (2 mL) oil. Scrunch to enclose garlic in foil. Roast in preheated oven for 20 minutes or until soft. Remove from oven, leaving oven on, and let cool slightly. Squeeze garlic from skins, discarding skins; coarsely chop garlic and place in a small bowl. Whisk in vinegar, 21⁄2 tbsp (37 mL) oil, pepper and salt; set aside. 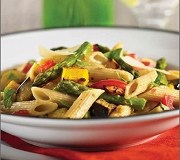 In a large bowl, toss red pepper, yellow pepper, onion, squash and eggplant with 1 tbsp (15 mL) oil. Spread vegetables on prepared baking sheet. Roast on upper rack of oven, stirring occasionally, for 15 to 20 minutes or until almost tender. In a small bowl, toss asparagus with the remaining oil. Add asparagus to baking sheet and bake for about 10 minutes or until vegetables are tender and lightly browned. Meanwhile, in a large pot of boiling salted water, cook pasta according to package directions until al dente. Drain, reserving 1⁄4 cup (60 mL) of the cooking liquid. Transfer drained pasta to a large serving bowl and toss with the reserved cooking liquid. Add roasted vegetables, tomatoes, basil and roasted garlic mixture; toss well to combine. Sprinkle with Parmesan. Serve hot or cover and refrigerate for up to 24 hours (let stand at room temperature for 1 hour before serving). Cutting all the vegetables to the same size ensures that they will cook evenly. Serve with grilled vegetarian sausage to add protein to this meal. © Cook! Dietitians of Canada. 2011. Published by Robert Rose Inc. All rights reserved. Permission to reprint in its entirety. For noncommercial use only.